There was a report in the news last week relating to research into the safest place for a baby to sleep. According to the researcher I heard interviewed, the conclusion of the study was that the safest place for a baby to sleep is ‘in it’s own environment’. This struck me as rather curious, since I’d also read recently about the almost constant contact that babies in indigenous cultures enjoy with one or other of their parents. A couple of days later I was talking to a pregnant woman, and mentioned this, at which point she said “Older is not necessarily better”, and went on to point out that in the past many more babies died than currently do. (This is a favourite theme for anyone rejecting an ancestral model for lifestyle choices. That or, ‘no-one lived past 40’…) It wasn’t the time to be pursuing that debate, but I cycled home musing on it that night. So, acknowledging that I may be wearing my rose tinted specs, I’m still fascinated by the idea that populations with less of the trappings of western civilization might enjoy a closer connection to their environment than we generally do. And this connection imparts a kind of wisdom that we turned our backs on many decades ago. This is a subject that many writers seem to be delving into at the moment – Mark Sisson’s “Primal Connection” is directly related to this, and it’s a theme that Frank Forencich regularly writes about. Doubtless there are many more. Perhaps people that live in closer contact with their environment make choices for the health of their environment, rather than ease of living, as ‘civilisation’ and the industrial revolution have allowed us to do for the last century and a bit. If you know that your food and shelter is dependent on maintaining something of a symbiotic relationship between yourself and your surroundings then you are highly likely to behave in a way that preserves that relationship. The chances are that this way of living has been ingrained for centuries, so that it is interwoven with your learning, play and life in general as you grow. In other words, perhaps it’s unconscious – you know what’s important without knowing that you know. Again, this is my rose-tinted perception, reinforced by wonderful books like ‘Wild‘ by Jay Griffiths. In contrast, industrialisation and technology have allowed us to disconnect from the natural world more and more. (Aside from the practical implications, there is a rich vein of research into how this impacts our mental/emotional state). I’m certainly not about to give up a home with central heating, but I can believe that some time amongst trees and plants nourishes me in ways that food cannot. Perhaps as the basis of postmodern theory (which I understand, highly simplistically, to be something like; ‘reality has been replaced by symbols and simulations of reality’ – apologies to Baudrillard if I’m way off the mark) we seem to have become very good at identifying problems that we have created for ourselves through technological advances, and remedied them with more ‘technology’. MBT shoes seem to be the perfect illustration of this idea – We recognise that there’s a problem with shoes, and pavements, flat ground etc. So instead of removing our shoes, and trying to spend more time with our feet on a more natural surface, we develop shoes that move us further away from true connection to the ground, whilst trying to represent that connection. Duh. How about ‘ergonomic’ chairs? We recognise that sitting at a desk in front of a computer screen, controlling a mouse, and typing isn’t working out to well for us. No surprises there – we’re not ‘built’ for sitting for long periods, the load on our spines increases two-fold when we go from standing to sitting. The solution is, of course, to design a chair that makes us ‘better’ at sitting. One that actually requires less muscular connection in order to remain in the same dysfuntional position. We no longer have the innate sense that should tell us that sitting for hours at a time is a bad idea. It reminds me of a conversation I had years ago with a martial arts enthusiast (and osteopath). His theory was that Pilates is essentially the same practice as yoga, tai chi, karate, kung-fu, kendo etc., but modified for a Western sensibility. One of the crucial differences is that, in the countries from which those other movement practices originate, children would be practicing them form a young age – repeating movements over and over again. By the time that they were old enough to question why they were going through these movement patterns, they had no need to ask the question because their body had learned the answer through the action. His argument went on that people doing Pilates often need to ask, or understand intellectually why they are doing particular exercises because they have not had the opportunity to develop that innate ‘body intelligence’. Could this be the perfect squat? Sorry, can’t find who to credit for this image…. 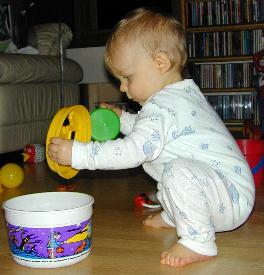 A brief search on YouTube will quickly elicit plenty of video clips of toddlers doing ‘perfect’ squats, deadlifts etc. – the evidence seems fairly clear that we ‘know’ how to move well at a very young age, or at least that moving well is woven into our early development. Things seem to go wrong around the time that we start to put children in shoes, and make them sit for prolonged periods of time. Shoes and chairs are simple examples of technological advances that are creating problems for us, far beyond what surely could have been imagined when they were first conceived. Just as ‘older isn’t better’, newer is not better either. More importantly, increasing the disconnect between ourselves and our environment is a recipe for newer, perhaps more complicated problems (I’m envisioning later scenes in the excellent Pixar animated film ‘Wall-E” – if you don’t know what I’m referring to, please put this blog post down immediately and remedy the situation – I guarantee it’s way more entertaining). So older is not necessarily better, but wisdom might trump technology. Returning to the subject that I started with, of baby’s safest sleeping place, isn’t it strange to think that a baby should have its own environment, that is separate from that of its parents? Does that occur in any other species of mammal? Is this perhaps a sign of our fundamental loss of sensitivity to our surroundings, that an adult’s sleeping space is inherently dangerous to a baby? Or have we truly figured everything out better than any of our ancestors did?